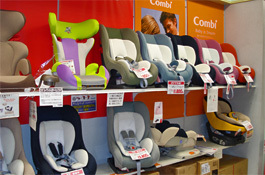 Provides the best fit for younger babies. The baby is held securely by a shoulder harness (adjusted snuggly, with only one finger fitting between the harness and the baby?s collarbone). The chest clip should be positioned at the armpit level. Should not be used in a passenger seat with an airbag. The child should weigh at least 22 lbs AND can pull to stand independently to go in a forward-facing seat. Any earlier and the child?s neck and back muscles and bone structure are not strong enough to withstand crash forces. The car seat must be anchored with a tether strap and must be securely attached to a bolt anchored to the rear shelf of a car or floor of a van, station wagon or hatchback. If the mid-point of the child?s ears are over the back of the child restraint but the child does not yet weight 40 lbs, the child should be moved to a combination child seat/ booster seat. The booster seat raises the child so that they?ll fit an adult seat belt properly. The child should use a booster seat until they?re over the manufacturer?s upper weight limit or height limit, or the mid-point of ears are above the top of the high back booster or vehicle seat. The lap belt should be worn low on the hips, touching the upper thighs, to prevent abdominal injuries or spinal damage. The shoulder belt should be worn over the shoulder and across the chest. The child should sit fully upright with their back against the vehicle seat. Never put the shoulder belt behind your back or under arm.